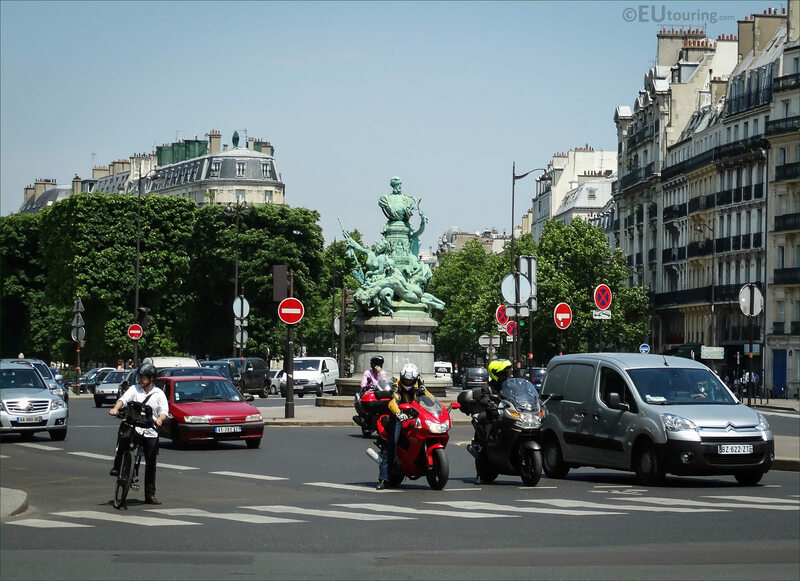 This time we were in the 6th Arrondissement of Paris when we took these high definition photos showing a busy intersection that is home to the bronze statue group of the Francois Garnier Monument, which was sculpted by Denys Puech in 1898. 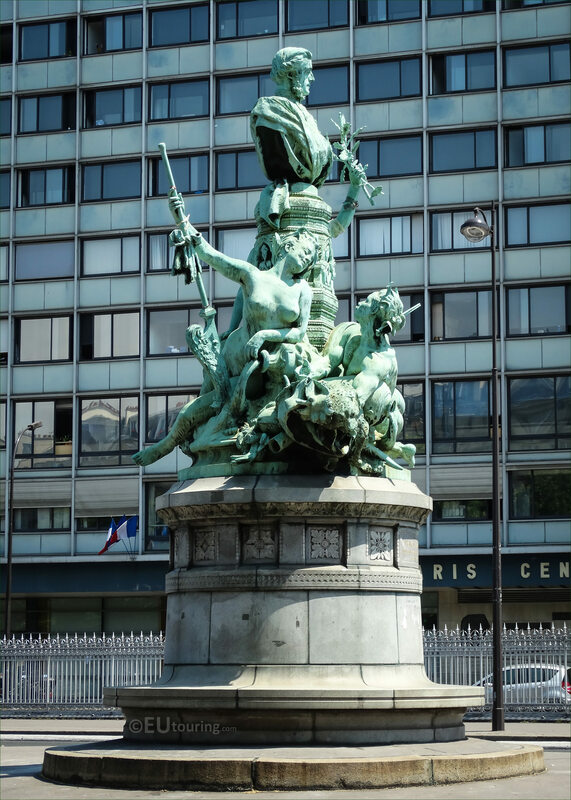 We were walking down the Avenue de l'Observatoire towards the Paris Observatory when we came across this statue group of the Francois Garnier monument that is located at the Place Camille Jullian, which is situated in between the crossroads, or intersections, for the Rue Notre Dame des Champs and the Rue d'Assas in the 6th Arrondissement. 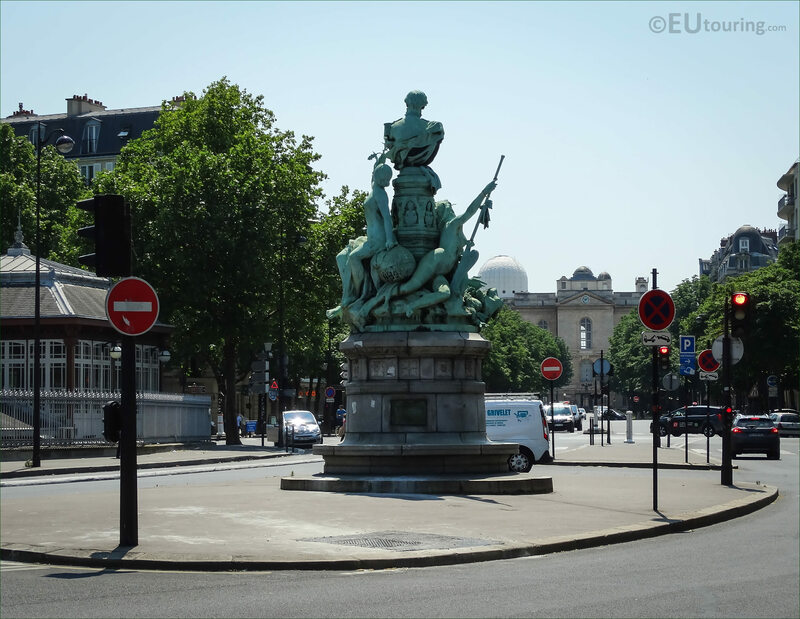 Now this particular HD photo shows the location of the Francois Garnier Monument, and as you can see these bronze statues sit right in the middle of a busy junction that is along the Avenue de l'Observatoire, and we took this photo as though we were looking towards where the road meets the Boulevard Saint-Michel and in the direction of Jardin du Luxembourg. 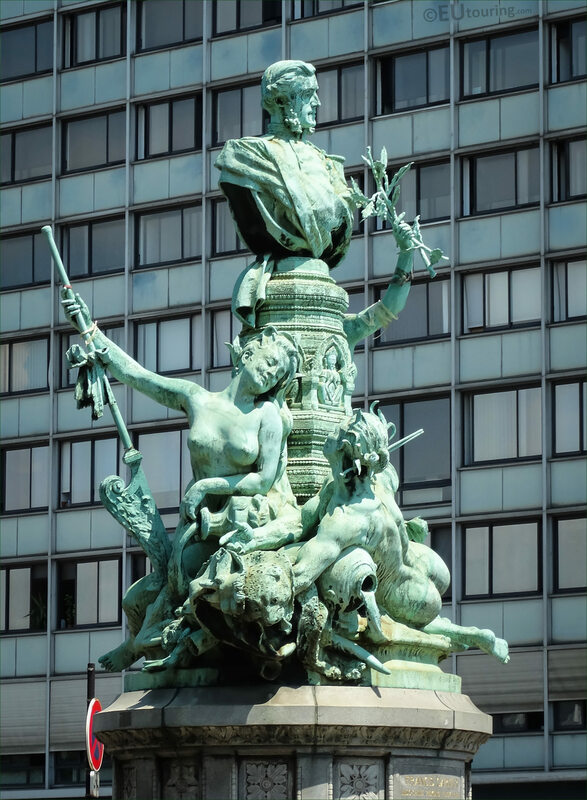 Here you can see a close up high definition photo of the statue group, which has a bust of Francois Garnier, or as we would know in English, Francis Garnier, on the top and below are women representing different aspects, such as the one to the left holding an oar, and the one to the right is laying over an urn that is spilling water, and this is designed to represent a river. 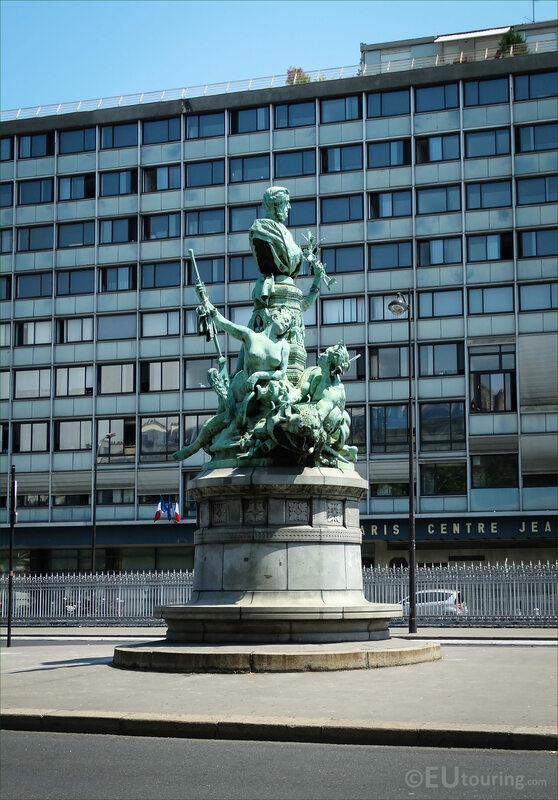 This next photograph shows the bronze Francois Garnier statue on its pedestal, which was produced by the French sculptor Denys Puech in 1898, who was actually born in 1854, and after having been awarded the Prix de Rome he received several official commissions from the Third Republic including this monument, and later he was made a knight of the Legion of Honour and became a director of the French Academy in Rome prior to passing away in 1942. So this statue group called the Monument a Francois Garnier in French, is dedicated to Marie Joseph Francois Garnier who was born in July 1839 and became a French officer and explorer who is best known for his exploration of the Mekong River in Southeast Asia, and hence the allegorical female statues we mentioned earlier, yet he was brutally killed by natives while trying to take over a city in December 1873. 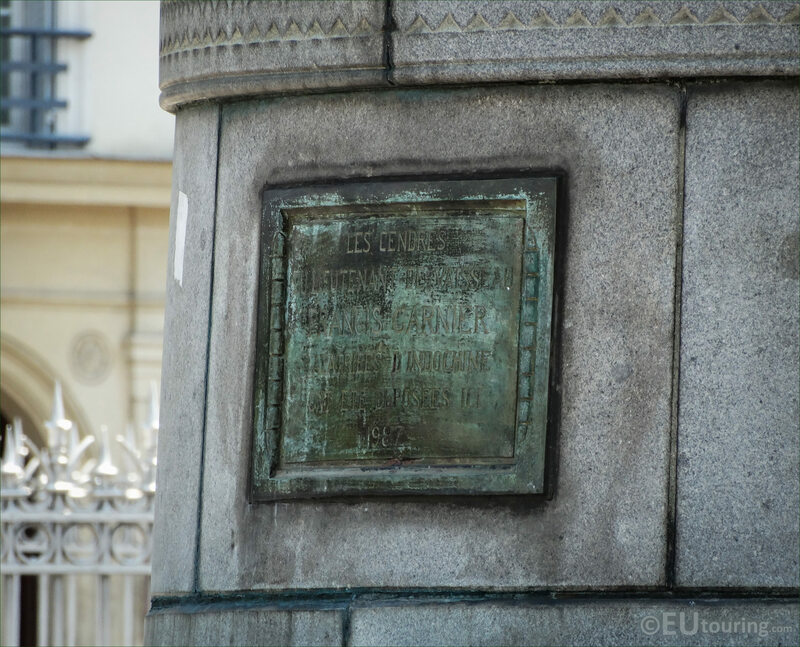 But eventually his ashes were brought back to France in 1983 from the former French Indochina by ship, and in 1987 they were placed within the monument in a formal ceremony and this particular image shows a close up of the plaque that was put in place at the ceremony. 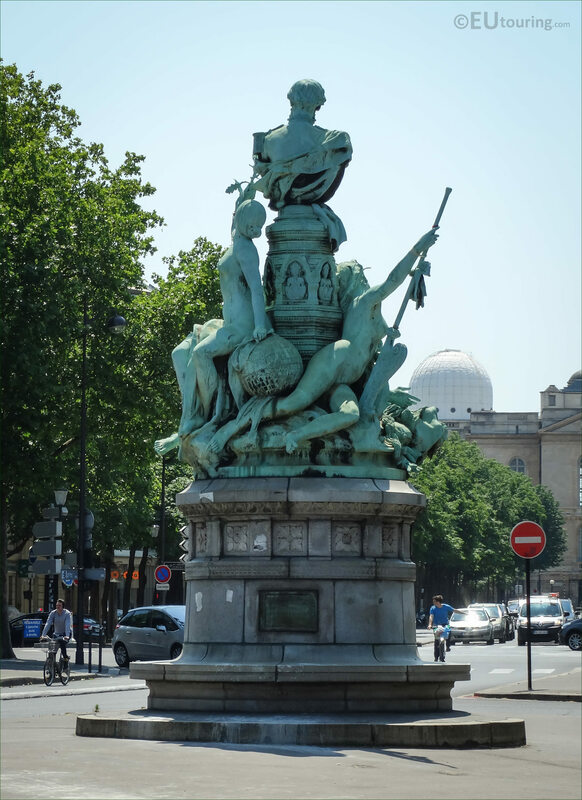 And this last image shows the back of the monument dedicated to Francois Garnier, and as you can see, there is also an additional allegorical female figure, which is leaning on a globe that shows Asia and the Equator, plus she is passing a laurel branch up to Garnier, which was designed this way in recognition of his explorations.